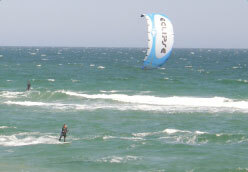 Waves is a great spot for water sport enthusiasts of all interests and levels. A part of the tri-villages on Hatteras Island, Waves is nestled between Rodanthe and Salvo. This quaint village is a narrow strip of land separating the expansive Atlantic Ocean and the Pamlico Sound. Due to the natural phenomenon of the off-shore winds blowing across the Atlantic to the Pamlico Sound, Waves marks the perfect location for watersport enthusiasts. Waves is known for being one of the top locations in the world for windsurfing and kiteboarding. You will also find a number of public launch areas to the Pamlico Sound. For beach-goers’ Waves is home to a beautiful white sand beach that will allow for relaxation and loads of family fun. For the foodie in the group, there are a number of locally-owned restaurants to try, offering a large variety of options from fresh North Carolina seafood to delicious Asian-inspired cuisine. Originally called “South Rodanthe”, to this day locals sometimes have difficulty telling where Rodanthe ends and Waves begin. Sun Realty is proud to represent vacation homes in the village of Waves and the properties offered by Sun Realty range in size from original "beach boxes" to larger, five and six-bedroom, OBX rental homes.